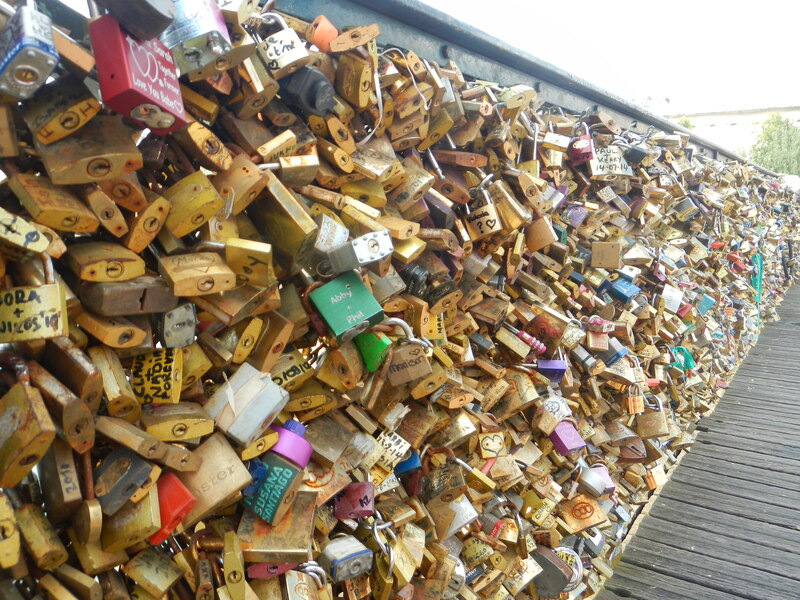 What began as a romantic gesture (a pretty cool idea, I agree) has spread like a virus, and the whole bridge is now blanketed in signed padlocks. The effect is striking. The once ordinary wire fence is now shining gold in the sun, swollen and lumpy with locks piled upon locks. Locks are attached to other locks, and in most parts, you can’t even see through anymore. …And here’s the same bridge in July 2014! It’s spreading to nearby fences, too, along the banks of the river. Hawkers have cottoned onto the phenomenon, and padlocks and permanent markers are for sale everywhere for a few Euros. 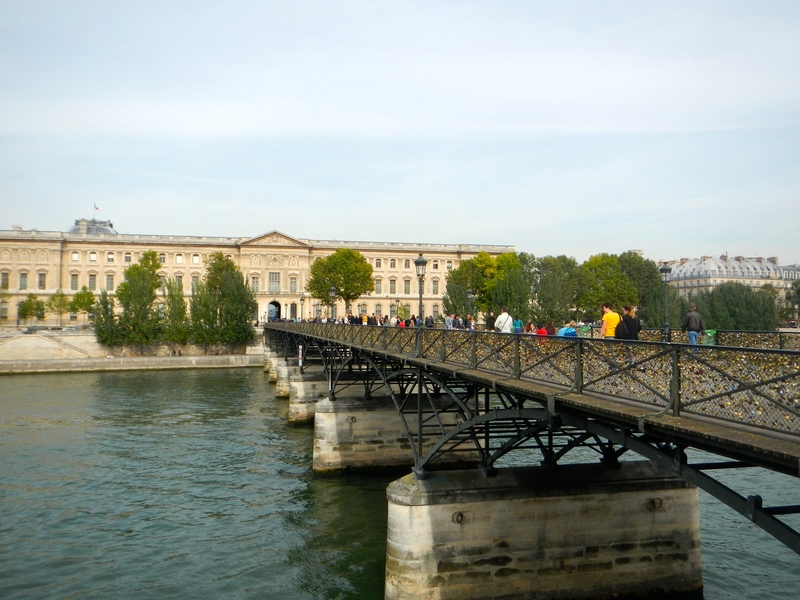 Even though one of the biggest of Parisian attractions is nearby (The Musee du Louvre), Pont des arts has become something of a tourist attraction in itself. It’s a shame – the bridge is actually quite beautiful, and a few locks didn’t hurt it. But now they’re tearing it apart, and it looks like a junkyard. Without space for locks (and motorbike locks), people have taken to plain old spray paint graffitiing. The fallen panels have been replaced, but the locks are coming back. The craze began in 2008, and caught on. A few months ago, in June 2014, a section of the railing collapsed – half a ton of brass and steel pulled it clean off the bridge. The council, understandably anxious that someone on the bridge or on a boat is going to be crushed one day, is trying to remove the locks. There’s around 700,000 locks attached, and all up, the bridge is supporting 34 tonnes of metal as extra weight. That’s like stacking more than 22 cars on a bridge built for pedestrians only! 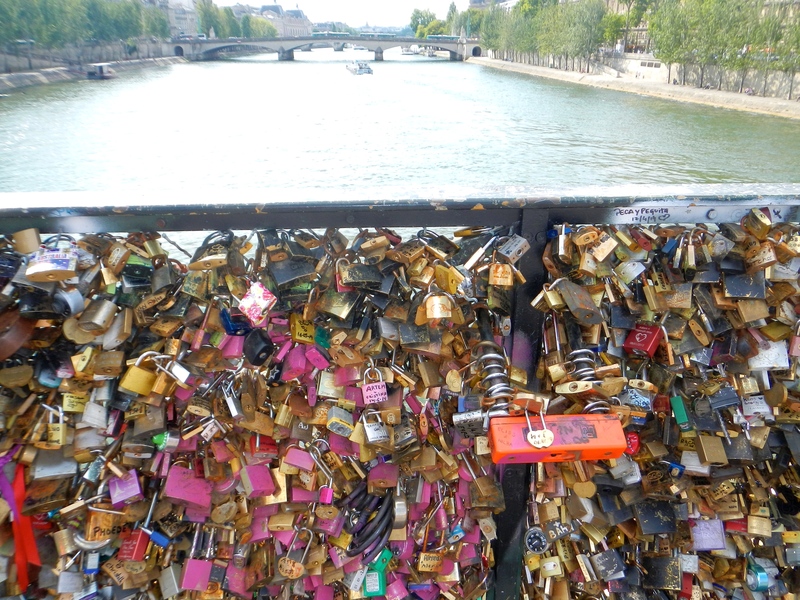 There’s worries too about the keys of unbreakable love corroding and polluting in the river water below. 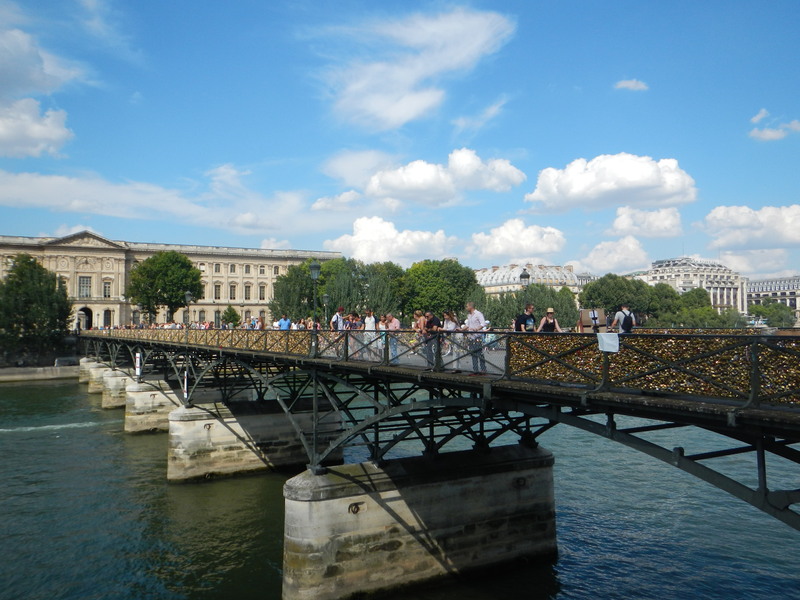 As of October 2014, there are plans to replace all the railings with heavy glass panels. 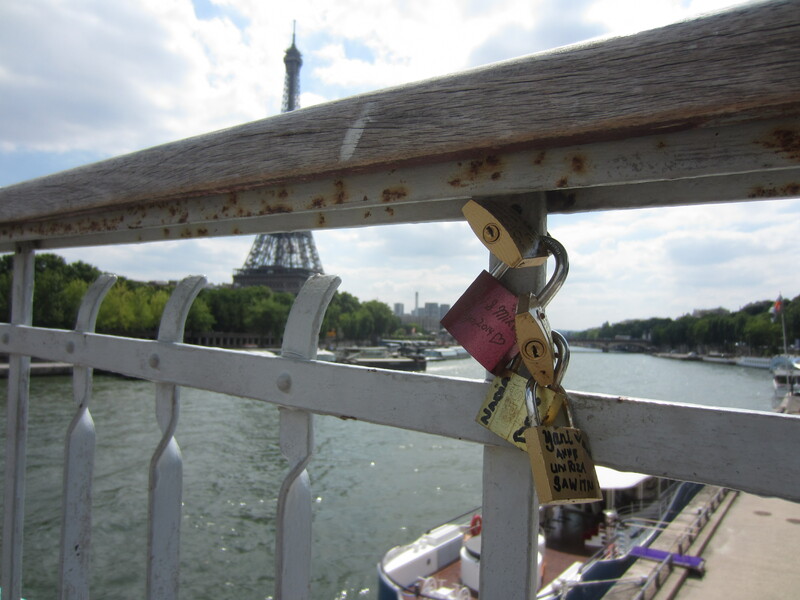 That should solve the problem – for Pont des Arts at least! What do you think? Is it graffiti to add a lock to the bridge? An act of love? Or even art? Perfect example of the negative effects of something “gone viral”. As you mentioned, it was cool before it got mainstream and every began copycatting. Now theirs a safety hazard, with a aesthetically displeasing bridge to boot. Exactly, yeah. 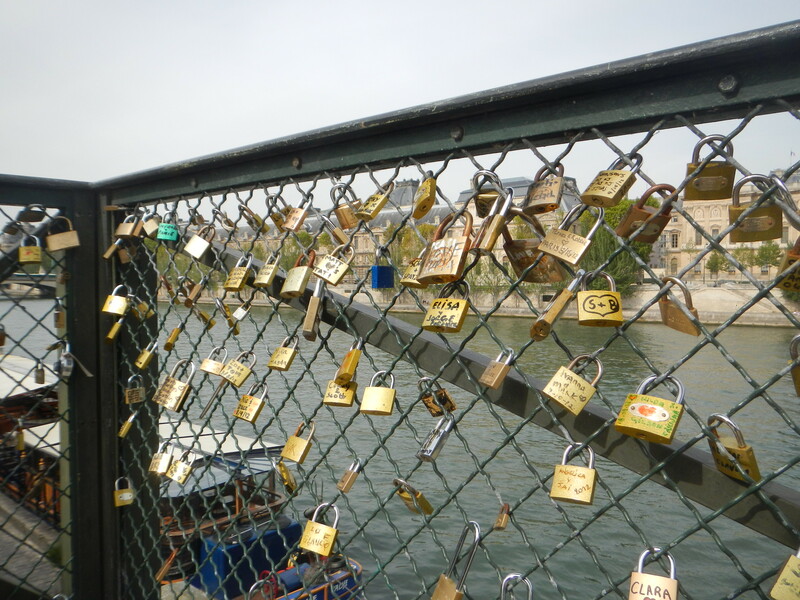 Once it becomes a copycat thing the locks begin to lose their original romantic meaning.